Kodagu is a district of Karnataka State in Southern India. It is also known by its anglicised name of Coorg. It occupies about 4,100 square kilometers of land in the Western Ghats of Southwestern Karnataka. As of 2001, the population was 5,48,561, with some 13.74% of the population residing in the district’s urban centers. Kodagu’s capital is Madikeri. 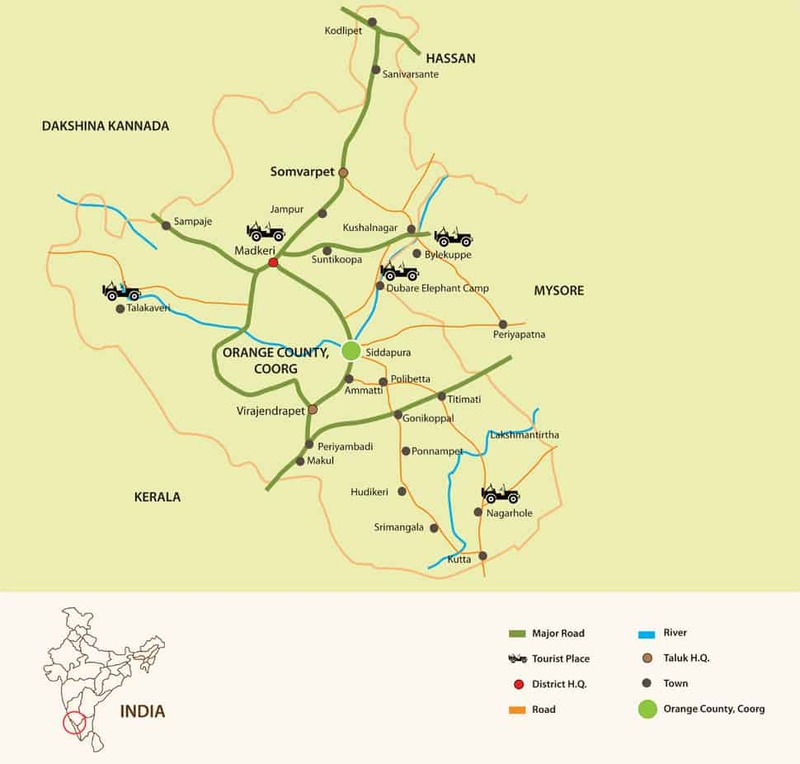 The district is bordered by the Dakshina Kannada District to the Northwest, the Hassan District to the North, the Mysore District to the East, the Kannur District of Kerala State to the Southwest, and the Wayanad District of Kerala to the South. Kodagu is on the eastern slopes of the Western Ghats. It is a hilly district with the lowest elevation in the district at 900 meters (2,900 ft) above sea-level. The highest peak, Tadiandamol, rises to 1,750 meters (5,700 ft), with Pushpagiri, the second highest, at 1,715 meters (5,600 ft). The main river in Kodagu is the Kaveri (Cauvery) River. The Kaveri starts at Talakaveri, located on the eastern side of the Western Ghats, and, with its tributaries, drains the greater part of Kodagu. In the rainy season, particularly during the southwest monsoons from June to the end of September, the currents are rapid and violent. In July and August, rainfall is intense, and there are often rain showers into November. Yearly rainfall may exceed 4,000 millimeters (160 in) in some areas. In dense jungle tracts, rainfall reaches 3,000 to 3,800 millimeters (120 to 150 in) and 1,500 to 2,500 millimeters (60 to 100 in) in the Bamboo District to the west. Kodagu has an average temperature of 15°C (59°F), ranging from 13 to 35°C (55 to 95°F), with the highest temperatures occurring in April and May. The principal town, and District Capital, is Madikeri, or Mercara, with a population of around 30,000. Other significant towns include Virajpet (Viraranjendrapet) and Somwarpet. The district is divided into the three administrative Talukas (Divisions) of Madikeri, Virajpet and Somwarpet.